Ph.D. student Adrian deFreitas uses Impromptu, a system that accesses shared apps only when needed, such as a public transit app when the user is standing near a bus stop. Anind Dey (right), director of HCII, is lead investigator on the project. “The goal of our project will be nothing less than to radically enhance human-to-human and human-to­-computer interaction through a large-scale deployment of the Internet of Things (IoT) that ensures privacy, accommodates new features over time and enables people to readily design applications for their own use,” said Anind K. Dey, lead investigator of the expedition and director of CMU’s Human-Computer Interaction Institute. Just as Carnegie Mellon pioneered distributed computing in the 1980s by deploying the first fully wired university campus, the expedition will use the CMU campus to develop and test the new IoT technologies. Carnegie Mellon researchers will work with colleagues at Cornell, Stanford, Illinois and Google to create GIoTTO, a new platform to support IoT applications. Initial plans for GIoTTO include sensors that are inexpensive and easy to deploy, new middleware to facilitate app development and manage privacy and security, and new tools that enable end users to develop their own IoT experiences. “We funded the Open Web of Things expedition to encourage universities to explore various aspects of system design that could help enable the Internet of Things,” said Maggie Johnson, director of university relations for Google. “From the many excellent proposals received, we’ve chosen Carnegie Mellon to lead because of their vision for a living laboratory, validating system design through daily use. Cornell, Illinois and Stanford were selected to join based on their unique approaches for tackling critical challenges related to privacy & security, systems & protocols and HCI. “We believe the collaboration with and across universities will accelerate innovation and IoT adoption,” she added. Google initially will provide $500,000 to Carnegie Mellon to launch the expedition. In addition to Dey, the lead team includes Yuvraj Agarwal, Chris Harrison, Jason Hong, Andrew Moore, Anthony Rowe and Mahadev Satyanarayanan from CMU’s School of Computer Science and College of Engineering. Though privacy and security are features of GIoTTO, a second CMU team, led by Computer Science Professor Norman Sadeh, will develop a novel technology to further protect the privacy of IoT users. “We will demonstrate the use of personalized privacy assistants that help users configure the many privacy settings necessary to ensure that they retain adequate control over their data,” Sadeh said. Joining him on that team are Lorrie Cranor and Lujo Bauer. 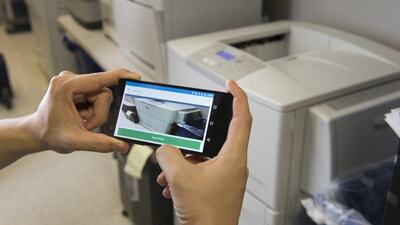 "Snap2It" lets users link to a printer or projector simply by taking a smartphone photo of it. The promise of the IoT is that embedded sensors in buildings and everyday objects can be interweaved to create smart environments. For instance, CMU researchers have created Snap2It, a system that lets users link to a printer or projector simply by taking a smartphone photo of it, and Impromptu, a system that accesses shared apps only when needed, such as a public transit app when the user is standing near a bus stop, or a retailer app when visiting a store. The mission of the Google expedition is to fulfill the IoT’s promise by creating a complete system of interoperable IoT technology and finding answers to key research questions, such as how to preserve privacy and ensure security in an increasingly sensor-filled environment. To create the living lab for the IoT, the expedition will saturate the CMU campus with sensors and infrastructure, recruit students and other campus members to create and use novel IoT apps, and eventually expand these efforts to the wider Pittsburgh community. By creating open IoT technology that can be freely shared and enhanced, Google and the expedition researchers hope to accelerate innovation and adoption of the IoT.